MPs on the budget review committee quizzed Finance Minister Abdulla Jihad yesterday about revenue raising measures proposed within the record MVR24.3 billion (US$1.5 billion) state budget for 2015. Briefing the committee yesterday (November 10), Jihad explained that MVR3.4 billion (US$220 million) in additional revenue is anticipated from raising import duty rates from July onward and introducing a ‘green tax’ for tourists. Additionally, acquisition fees from investments to special economic zones (SEZs), income from the home ownership programme, and leasing 10 islands for resort development would help raise the forecast revenue. The minister also told the committee that domestic debt had reached about MVR20 billion (US$1.2 billion)- 39 percent of GDP -making the rolling over of T-bills “a nightmare”. The government was considering increasing custom duties “mostly for luxury items, or items that are harmful to the environment or health,” he said. Tariffs for tobacco would be raised from the current 150 percent to 300 percent while duty would be raised from 100 to 150 percent for cars, and zero to 10 percent for perfume, Jihad said. Asked if higher custom duties would lead to higher prices, Jihad said the impact on the inflation rate would have to be studied, which would take time to complete. Jihad stressed that the government has ceased deficit monetisation – borrowing money from the central bank to finance the deficit – in May, as a result of which the inflation rate was reduced to 1.4 percent. Meanwhile, the forecast for income from SEZ acquisition fees is US$100 million, Jihad revealed, which is expected by August 2015. A further MVR400 million (US$25.9 million) is forecast from leasing and sale of land from across the country, Jihad said – in particular, plots from unused reclaimed land in various islands. The state-owned land designated for leasing or sale falls under three categories, he explained, which were residential, commercial, and industrial. Moreover, 10 new islands would be leased next year for resort development, he continued, which would generate income for the government in the form of acquisition costs. As an incentive or relief for new resorts with development stalled due to financial constraints, Jihad said the government would waive import duties for construction material or capital goods next year. Tourism Minister Ahmed Adeeb revealed yesterday that a green tax of US$6 per night would be introduced in November 2015 and guest houses would be exempt from the tax. Jihad said the income from the green tax would be used for water, sewerage, and coastal protection projects. Of the proposed revenue raising measures, import duty revisions and introduction of a green tax would be subject to parliamentary approval, which the finance minister hoped would be granted as the budget was passed. Legislative compromises to new revenue measures led Jihad to express fears in August that the predicted state deficit for 2014 would more than double in 2014. The outstanding stock of treasury bills (T-bills) is currently MVR10 billion (US$648.5 million), said the finance minister. In his budget speech last week, Jihad observed that the state’s debt would reach MVR31 billion (US$2 billion) or 67 percent of GDP by the end of 2014. Expenditure on state employees in 2014 would reach MVR15.8 billion (US$1 billion), Jihad observed, while MVR3.2 billion (US$207 million) would have been spent on subsidies and social security benefits. Consequently, the government was facing serious difficulties in “managing the state’s cash flow and financing the budget” as well as securing loans for budget support, Jihad said. According to the central bank, the total outstanding stock of government securities was MVR13.6 billion (US$881 million) at the end of September. Spiralling debt is threatening “the economy’s health”, Jihad said yesterday, with the rolling over T-bills proving to be difficult as the ministry has to plead with banks for extension of repayment periods. “For example, if MVR600 million matures this week and there is MVR700 million in the public bank account, if the MVR600 million is rolled over there’ll be MVR100 million. How can we run the state with that? It can’t be done,” he explained. The solution was raising additional revenue by utilising resources such as uninhabited islands, he continued, and appealed for cooperation from parliament. Additionally, the government was trying to extend the periods for repayment of debt. The interest rate for T-bills is currently 7.5 percent, Jihad said, down from 10 percent before the current administration took office. 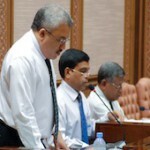 “This year we estimate that MVR1.2 billion worth of T-bills have been used by the state for finances. In 2015, it will be MVR440 million,” he noted. Perhaps the honourable Minister should concentrate on the other side of the coin - spending. The state budget is $1.3 billion, but the GDP of the country is about $3 billion. Most of this goes to salary and social security - so it isn't even investment in infrastructure or other means by which to guarantee future economic growth. And perhaps Minivan news can comment on whether such spending is high by international standards of small island developing countries? Next Next post: Is the government protecting the youth from drugs?